The Description of Folk Customs in Goishi is a report that was produced by the Department of Intangible Cultural Heritage last year documenting religious festivals and life in the Goishi region of Massaki-cho in the City of Ofunato, Iwate Prefecture. The region was stricken by the massive tsunami that followed the Great East Japan Earthquake. An attempt to read this report together with local residents and put it to use has begun. The Kasumigaseki Knowledge Square has been active in the Massaki region. As part of the Square’s Digital Community Center, a class was conducted entitled “Learn in Massaki! A look back at our hometown…via the Description of Folk Customs in Goishi.” KUBOTA Hiromichi of the Department of Intangible Cultural Heritage attended the class. The class took place at the Hometown Center in the Massaki region and it had about 30 attendees. After a lecture, attendees exchanged various types of information. In the future, local residents will take the lead in creating descriptions of more familiar folk customs and in passing on those customs to local children. This approach was evident in the class. Preserving local identity is a concern since communities are scattered or they are relocating to higher ground. The Department of Intangible Cultural Heritage plans to continue its efforts, and its efforts in the Goishi region may serve as a case study. 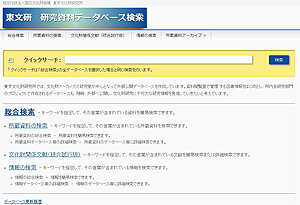 The Description of Folk Customs in Goishi (in Japanese) is available in PDF format on the website of the Department of Intangible Cultural Heritage . 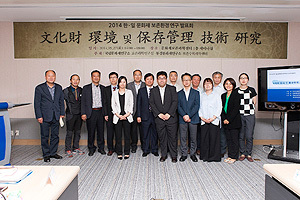 The Center for Conservation Science and Restoration Techniques concluded a memorandum of understanding with the Conservation Science Division of the National Research Institute of Cultural Heritage of the Republic of Korea. Both institutes are proceeding with “Joint research on the effects of environmental pollution on cultural properties and R & D of conservation techniques.” Specifically, both institutes are conducting joint field studies of outdoor stone heritage in both countries and they are both hosting an annual conference. Researchers from both institutes are endeavoring to share their results with their counterparts. National Research Institute of Cultural Heritage, the Republic of Korea is overseeing the research this year, so a conference was held on May 27 in a lecture hall at the Cultural Heritage Conservation Science Center. 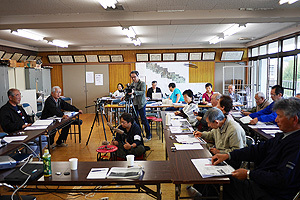 The conference was attended by OKADA Ken, KUCHITSU Nobuaki, and MORII Masayuki from the Center for Conservation Science and Restoration Techniques. The conference garnered interest, as was evinced by the almost packed venue. At the conference, lead Japanese and Korean researchers and cooperating university professors gave presentations on stone heritage, and an active discussion took place with attendees asking numerous questions and offering numerous comments. Plans are to conduct joint studies of cave tombs in the future. The Japan Center for International Cooperation in Conservation held its 6th workshop at the History Museum of Armenia from May 20 to 27, 2014. This workshop is part of the Networking Core Centers for International Cooperation on Conservation of Cultural Heritage Project commissioned by the Agency for Cultural Affairs. The project is planned to last 4 years, and the aims of the project are capacity building and technical transferring in the conservation of archaeological metal objects. This year is the final year of the project, and the theme of this year’s workshop was “Exhibition in Museums”. The workshop was held for 6 experts from Armenia and 2 experts from Georgia and Russia. Japanese experts gave lectures on the case studies of exhibitions at Japanese museum, the effects of light, temperature, and humidity that must be considered during exhibition, the exhibition explanation panels, and materials used for exhibition works. Then, the participants took the lead in displaying the archaeological metal objects that had been conserved in the previous workshops. Not only to publicize the achievement of the joint Armenian-Japanese projects but also to inform the visitors about conservation activities of this project, various opinions regarding the exhibition plan were exchanged among the participants. 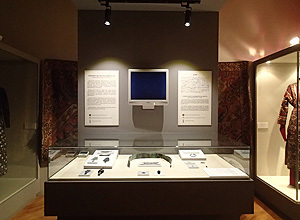 Specifically, photographs of the object before conservation were displayed beside the conserved objects to show the difference while the slide show depicting every step of the conservation works was shown. 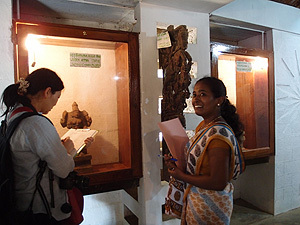 More detailed information achieved through the studies on the exhibited objects was included in the brochure. The exhibition preparations finished on the final day of the workshop. 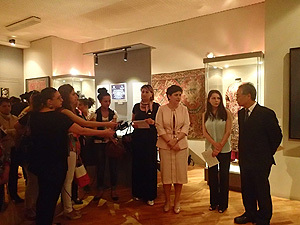 The opening ceremony for the exhibition took place on the same day, and both the persons concerned in this project as well as persons not related with the History Museum of Armenia attended the ceremony. The workshop has concluded, and a report on the workshop is planned to be published in the future. In April 2011, a large-scale pro-democracy movement developed in Syria, and that groundswell shows no sign of stopping. In actuality, Syria is currently in a state of civil war. There are over 140,000 dead in Syria, and over 4 million people have fled the country. Damage to Syria’s cultural heritage has made major news as the civil war unfolds. World heritage sites that epitomize Syria, such as Aleppo, Palmyra, and Krak des Chevaliers, have become battlegrounds. Many archaeological sites have been looted and many museums have been plundered. The illegal export of cultural properties from Syria is an international concern. In light of this situation, UNESCO began a new project, Emergency Safeguarding of Syrian Cultural Heritage, this March to safeguard Syria’s cultural heritage with the support of the EU. 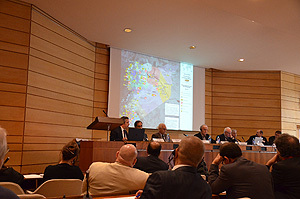 As part of this project, “International Expert Meeting: Rallying the International Community to Safeguard Syria’s Cultural Heritage” was convened by UNESCO at its headquarters in Paris from May 26 to 28. The meeting was attended by over 120 experts from 22 countries. Two of those experts were YAMAUCHI Kazuya and ABE Masashi from the National Research Institute for Cultural Properties, Tokyo. The extent of damage to Syria’s cultural heritage was reported at the meeting, and future strategies to safeguard Syria’s cultural heritage were actively discussed. 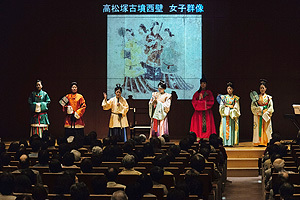 On May 8, an event entitled “Starting with the Days of the Nara Palace: A Fashion Show of Asuka & Tempyo Attire” took place in the Heiseikan of the Tokyo National Museum (organizers: Asuka Mura, the Agency for Cultural Affairs, Japan, the Tokyo National Museum, the National Research Institute for Cultural Properties, Tokyo, the Nara National Research Institute for Cultural Properties, and Asahi Shimbun, Collaborator: the Nakagawa Laboratory of the Graduate School of Creative Science and Engineering of Waseda University). The event was related to a special exhibit of Wall Paintings from the Kitora Tumuli that took place at the Tokyo National Museum from April 22 to May 18, 2014. Models for the event included 13 members of the staff of the National Research Institute for Cultural Properties, Tokyo. This valuable experience of wearing ancient handmade attire was a first. All of the clothing was made by hand by ancient attire researcher YAMAGUCHI Chiyoko (who arranged the Tempyo attire). The historical setting of the Imperial Palace in Nara in year 3 of the Wadou era (710) was splendidly recreated thanks to planning and staging by SUGIYAMA Hiroshi, Head of the Department of Planning and Coordination of the Nara National Research Institute for Cultural Properties. Acting as a model, I experienced joyous anticipation and elation as I joined my fellow models in setting the stage while dreaming of the ancient world. As I wore beautiful clothes, had my hair coiffured, and adorned myself with numerous accessories, I was able to envision how people from the long-gone Imperial court conducted themselves. However, my imagination had its limits and I was reminded again of the difficulty of studying history. The experience was visceral. I would like to express my appreciation to everyone involved for all of their hard work. I hope to tackle history with a renewed interest.